Palpation of the affected chondrosternal joints of the chest wall elicits tenderness  and pain is reproduced by palpation of the affected cartilage segments which may radiate out into the chest wall. The thoracic wall consists of the sternum anteriorly, the spinal column (12 thoracic vertebrae) posteriorly, bounded by 12 paired ribs and costal cartilages. Ribs consist of bone and cartilage, with cartilage serving as an elastic bridge between the bony portion of the rib and the sternum. There are three types of ribs: the first seven pairs of ribs are called ‘true ribs’ because they are directly attached to the sternum. The eight to tenth pairs of ribs are called ‘false ribs’ because they are not attached to the sternum, but they are attached to each other. Finally the eleventh and twelfth are called ‘floating ribs’ because they are only attached posteriorly to the vertebrae. Each rib is attached posteriorly to the spinal column: rib 1 is attached to vertebrae 1, rib 2 is attached to vertebrae 2 and so on. Anteriorly, the costal cartilage of the first rib connects with the manubrium via a rigid fusion of bone and cartilage. The next seven pairs of ribs articulate with the sternum via cartilage at synovial-lined joints. Ribs eight through 10 attach anteriorly to the cartilaginous portion of the rib above them and often have synovial lined interchondral articulations. The lowest two ribs do not articulate with any structure anteriorly. 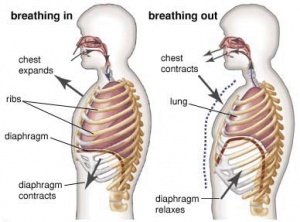 The ribs move with respiration and with truncal motion or movement of the upper extremities. 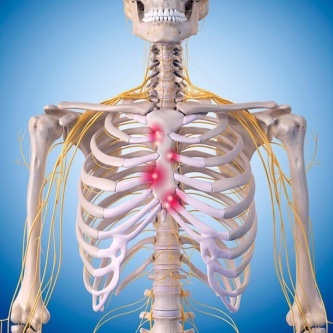 The intercostal nerves supply the innervation of the thoracic wall. 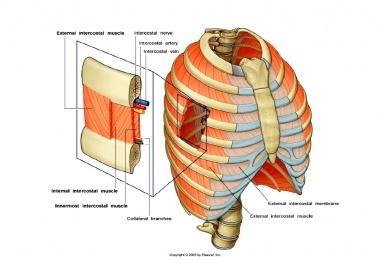 The inspiratory muscles (external intercostals, diaphragm) expand the chest volume by elevating the rib cage. and the expiratory muscles (intercostals, intercostals intimi and succostals) decrease lung volume by depressing the ribcage. Costochondritis can affect children as well as adults. Approximately 14% of adolescents present with costochondritis in out patients. In a prospective series of children three to 15 years of age presenting to an emergency department or cardiac clinic with chest pain, chest wall pain was the most common diagnosis, with respiratory and psychogenic conditions the next most common diagnoses. Costochondritis is a common diagnosis in adults with acute chest pain. It is present in 13 to 36 % of cases, depending on the study and the patient setting. This data issimilar to a study of patients with non cardiac chest pain that found reproducible chest wall tenderness (although not specifically defined as costochondritis) in 16 percent of patients. A European study found a higher prevalence of musculoskeletal diagnoses in patients with chest pain presenting in primary care settings compared with hospital settings (20 versus 6%, respectively). Costochondritis usually affects the 3rd, 4th and 5th costochondral joint and occurs more often in women, whereas Tietze’s syndrome most commonly affects a singular joint only, particularly the 2nd or 3rd costal cartilage and both sexes are affected equally. Both conditions can be of an acute or insidious onset at any age. On examination there may be hypomobility of the upper thoracic spine, costovertebral joints, and the lateral ribs. Interventions include postural exercises and manual therapies directed at the lateral and posterior rib structures to improve rib and thoracic spine mobility. Tietze's syndrome, a non-suppurative, tender swelling of the anterior chest wall, is a disorder of uncertain etiology and pathology, not to be associated with constitutional disturbances and of a prolonged fluctuating course. Familiarity with the uniform clinical manifestations of this relatively frequent entity makes its recognition fairly simple. The therapeutic approach includes reassurance of the patient as to the benign nature of this condition, along with supportive measures chiefly to allay pain. However, Tietze’s syndrome is much less common than costochondritis, and it tends to cause chest swelling in addition to the other symptoms, whereas costochondritis does not. Patients with fever, chest wall swelling, persistent cough or other respiratory issues should primarily have appropriate chest investigations. CT imaging can delineate a pathology in costal cartilages and rule out underlying pathologies such as tumors. CT is only reserved for cases where is high suspicion of neoplastic processes or infections, but CT cannot image bilateral involvement in one patient. Nuclear scanning with Technetium 99 scitigraphy is not useful for identifying costochrondritis. In patients with signs and symptoms of chest wall inflammation, scintigraphy can directly diagnose costochondritis. Bone scintigraphy delineates both the extent of individual costochondral lesions and their multiplicity. Patients older than 35 years who have a history with coronary artery disease and patients with cardio pulmonary symptoms should have an electrocardiogram and possibly chest radiography. Further testing should be considered for ruling out a cardiac cause if clinically indicated by age or risk status. Routine laboratory testing is not necessary in patients with suspected costochrondritis unless the diagnosis is uncertain or when there are signs of inflammation. The Global rating of change (GROC): to measure the patient’s subjective rate of improvement . Measurement of thoracic and cervical mobility: This is a relevant measure with costochondritis as the inflammation of the costochondral joints or the anterior chest wall can cause a reduction in mobility of the spinal area. Rotation of the thoracolumbar spine (TR): TR has high validity and sensitivity ranks and improvement of the measurement technology would probably result in a superior test for the follow-up. Patients with Costochondritis will present with chest pain that is reproducable by palpation of the affected area, with ribs 2 to 5 mostly affected. Aggravating factors can be slouching or exercise. It often occurs after a recent illness with coughing or after intense exercise and it mostly of unilateral origin. There may be an associated restriction of the corresponding costovertebral and costotransverse on examination. There is also loss of normal spinal movement associated with the chest pain. Palpation should be performed with 1 digit, on the anterior, posterior and lateral side of the chest, the clavicle, the cervical and thoracic spine. When on the affected area it reveals a reproducable pain which might suggest Costochondritis, but it cannot entirely concluded. Motion palpation is a manual process of moving a joint into its maximal end range of motion, after which it is challenged with a light springing movement. This end point of joint movement forms the basis for determining the normal or abnormal joint movement. When motion palpation is reduced, the joint is considered fixated or hypokinetic. Cardiac causes should be ruled out in patients who present with a high risk. Treatment consists of conservative management and is usually symptomatic,  to resolve the condition and manage pain. Management includes reassurance, local injections and topical or oral analgesics. The aim of reassurance is to reduce anxiety and to change beliefs and behaviours. 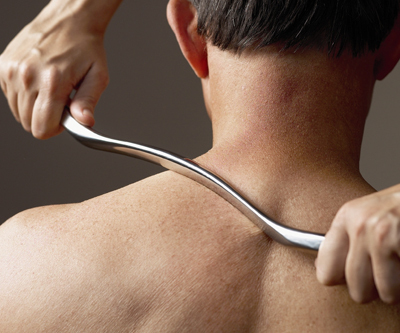 A course of trigger point therapy can help to reduce pain. This includes cross fibre friction massage and ischemic compression to the intercostal musculature and high velocity, low amplitude mobilisation of the rib in a posterior to anterior direction while the patient is in a supine position to create cavitation. Ice application may also be useful. Donald Aspergen at al. suggest using the Graston technique and Kinesio taping. The Graston technique is used on the chondrosternal joint of the concerned rib to relax the chondrosternal musculatuur. Kinesio tape is applied in 2 strips; the first strip goes vertically on the chondrosternal joint and the second strip is applied horizontally. Pain was improved by 70% after two weeks of treatment. ANNE M. PROULX. Costochondritis: Diagnosis and Treatment. Am Fam.Physician. 2009 Sep 15; 80(6):617-620. Costochondritis is defined as painful chronic inflammation of costochondral junctions of the ribs or chondrosternal joints of the anterior chest wall and it is often confused with Tietzen syndrome. Diagnosis is confirmed by a scan or bone scintigraphy and by a physical assessment of the affected costal cartilage. Treatment protocol consists of cross fibre frictions, HVLA, stretching of the pectoral muscles, kinesio taping, Graston techniques and pectoral muscle strength exercises. ↑ Saltzman DA, Schmitz ML, Smith SD, Wagner CW, Jackson RJ, Harp S. The slipping rib syndrome in children. Paediatr Anaesth. 2001;11(6):740-743. ↑ Wise CM, Semble EL, Dalton CB. Musculoskeletal chest wall syndromes in patients with noncardiac chest pain: a study of 100 patients. Arch Phys Med Rehabil. 1992;73(2):147-149. ↑ 16.0 16.1 Buntinx F, Knockaert D, Bruyninckx R, et al. Chest pain in general practice or in the hospital emergency department: is it the same? Fam Pract. 2001;18(6):586-589. ↑ 19.0 19.1 Han J N et al. ; Respiratory function of the rib cage muscles; European Respiratory Journal ISSN 0903 1993. ↑ Gregory P.L., BISWAS A.C., Batt M.E.,Musculoskeletal problems of the chest wall in athletes, Sports Med., 2002;32(4):235-50. ↑ 22.0 22.1 Motulsky AG, Rhon RJ. Tietze’s syndrome. J Am Med Assoc 1953;152:504–6. ↑ Martino F, D’Amore M, Angdelli G, Macarini L, Cantatore FP. Echographic study of Tietze’s syndrome. Clin Rheumatol 1991;10:2–4. ↑ 26.0 26.1 Brenda M. Birmann et al. ; Prediagnosis biomarkers of insulin-like growth factor-1, insulin, and interleukin-6 dysregulation and multiple myeloma risk in the Multiple Myeloma Cohort Consortium. Blood. 2012 Dec 13; 120(25): 4929–4937.